Another reason for so little blogging is my definite lack of progress on anything constructive. The vest I'm knitting my mom? Still waiting to be seemed at the shoulders (I mean really, how hard is it to find time to seam 3 inch strips of knitted fabric together??). The baby items? Waiting on buttons for one and I managed to run out of one color of yarn for the second project that I can't get locally and is currently out of stock online. Yay for planning. In a hurry, so photo quality? Nope. The right leaning cables are still wonky after blocking, but I can live with it. The only other project I've got on the needles right now is the Midsummer Aran pullover by Ginevra Martin I'm knitting with a hemp blend yarn. The progress is painstakingly slow, but I'm getting far enough along that seeing the pattern develop is fueling my motivation. As you can see, I've got quite a bit to go. I don't think I'll attempt anything this fiddly for a while after I get this finished. This project is sucking every last bit of what little "after 2 p.m." energy I have and I'm longing for some mindless stockinette stitching. I also need to find a new sock pattern to use with this lovely cake of Madelinetosh Tosh Sock in color way Rain Water. Thanks, Sarah! 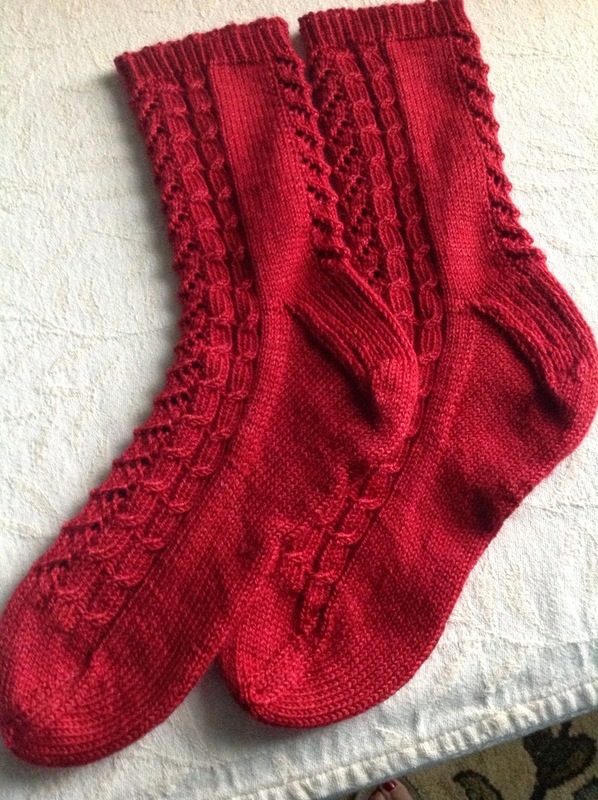 I wasn't sure how I would like the Waihi socks in the red but I'm so glad I used it--I LOVE them! Beautiful socks, Lisa! The leaning cables won't show when they are being worn. That's the great thing about socks. They are much more forgiving than other knitted items. How are finding knitting with the hemp? Does it hurt your hands? Thanks, Kristie! I've been surprised at how nice the hemp is to knit with. It is definitely a different feel than all of the squishy Merino I usually knit with, but since it's blended with cotton and rayon, it's not unpleasant at all. Can't wait for an 'action shot' of those socks - they look so lovely and cushy! I love the colour of your socks - beautiful. 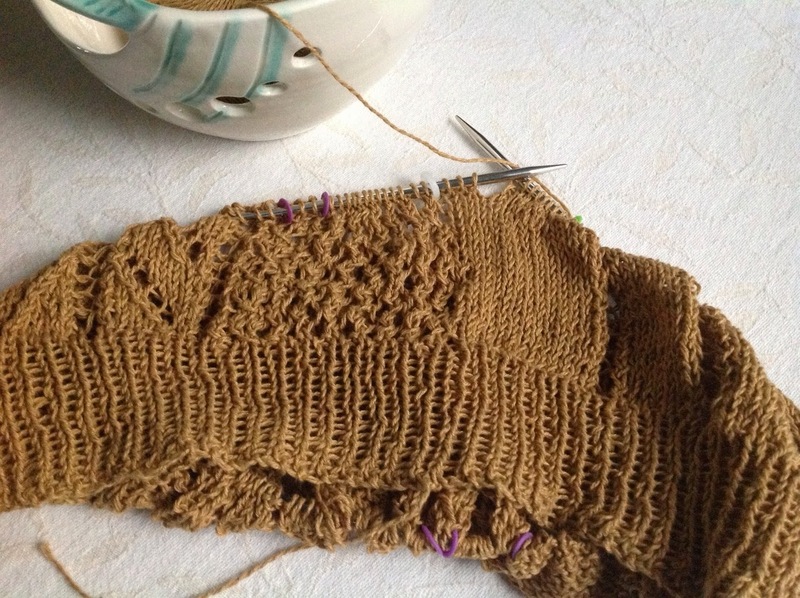 And the sweater is looking great, I know what you mean about it taking forever, even though I love sweater knitting!